While technically not a battle this event shaped Swedish history forever. The longlived hatred for everything danish did certainly exist even earlier but reached new hights and even culminated in the two countries waging wars with the aim to wipe out the very existance of the competitor over the next twohundred years This is hard to belive today since both Sweden and Denmark today regard each other as "brothernations". But that has not always been the case. Background: The union and Sten Sture the older. The Kalmarunion that bound Sweden, Denmark and Norway into one union still existed. While Sweden had managed to attain a considerable autonomy after the battle of Brunkeberg 1471 and in practice only shared king with Denmark the legal King of Sweden still was the Danish king. When the defeated Kristian I died in his son Hans became king of Denmark. But to claim himself as king of Sweden he had to be crowned in Sweden as well. In Sweden Sten Sture still ruled as chansellor but his position was weakened by a war in the east with an emerging power, the moscovites had proven themselves to be tougher that the novgorodians that had been beaten earlier. No decisive victory was won against the tsar Ivan Vailjevitj who actually was the first to call himself tsar. When Sten sture returned to Sweden in 1496 the counsil asked him to resign which he of course refused to do. He travelled to dalarna and urged the peasants to stand by him. Once again a peasant army marched with Sten Sture. The archbishops estates were put to the torch and he retaliated by banning Sten Sture. King Hans appeared with a strong army and besieged Stockholm. Sten Stures peasant army was defeated and he was forced to sign a treaty with rather generous terms. The king promised to keep the terms of the union and made Sten Sture "master of the court" which roughly would translate into prime minister. Thus king Hans was crowned king of Sweden in 1497. Sten sture was knighted as well and recieved all of Finland and Norrland as his personal property. This meant that he was better off working with the king than he had been opposing him. He actually had a larger income than the king which really wasnt a good thing. Sten Stures relatives and enemies overflowed with envy. Encouraged by the opposition to Sten Sture king Hans reclaimed the estates given to Sten Sture. Sten Sture reacted fast as a flash as usual. He contacted the oppostion and his old enemies Svante Nilsson and the archbishop Hemming Gadh. When the news that king Hans had suffered a setback in Germany 1501 the Swedish counsil proclaimed that they had disavowed loyalty and obediance to King Hans since he had not kept the terms of the union by appointing danish taxcollectors and taxing the country. Sten Sture was once again appointed chansellor and raised an army in dalarna. War was once again ravagning the country since king Hans didnt yield without a fight. There was fighting along the norwegian border and Swedish forces even conquered Akerhus and Törnsberg before being driven back. In 1502 the danish crownprince Kristian appeared at the head of his army in Sweden. 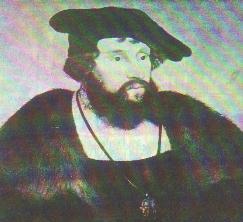 In 1503 Sten sture died and was replaced by Svante Nilsson. The war progressed slowly and without much success for the Swedes. In 1512 Svante Nilsson died which was a relief to many. A new chansellor was appointed. At first Erik Trolle, the archbishop, was chosen but he was outmaneuvered by the only twenty years old son of Svante Nilsson. Sten Svantesson. He had been knighted at the crowning of king Hans at the age of 5. He already had a brilliant career behind him and was a determined man with crystal clear ambitions. His grandfather was the famous Nils Sture Natt och Dag (Night and day). Svante Nilsson never used the name Sture but the young man immidietly recognized the value of the name and subsequently called himself Sten Sture the younger. There were no family ties to strengthen this but who asked for such? His next move was equally brilliant. He managed to postpone the commisioning of Erik Trolle for five months and went on a traveltour almost like an american presidential candidate. Holding fiery speeches in Sten Sture the olders old estates. The people cheered and the counsil was forced to appoint the young Sten chansellor. An eighteen year old Gustaf Eriksson Vasa came to Stens court and listened and learned. The powerstruggle between Sten and Erik Trolle was the seed to the horrible play eight years later. The stage is set. The actors are all present. This winter king Hans fell into the water outside of Norway and drowned. His son Kristian became king. He was considered unbalanced and unpredictable. In Sweden the usual intriguing and powerstruggle continued. It led to an open fight between Sten and Erik Trolle who withdrew his private army to his fortified castle Stäket. The bishops being wealthy and powerful,often with small armies, often had less education than worldly power and rarely put much effort into christianity. They were unpopular and it was easy to gain suupport to fight them. The danish archbishop in Lund came to his brothers aid by banning Sten. In 1517 a danish army of 4000 men under Joakim Trolle (Eriks uncle) sailed up the Swedish coast looting. The archbishop in his castle celebrated. But the danish army was defeated by Sten in the battle of Vädla. Now Erik Trolle wanted to negotiate but he was told that it was to late. He was demoted by the counsil and his castle was torn down brick by brick never to be rebuilt. This attack on a holy man was something unheard of. To defend themselves against being banned by the church the members of the counsil all declared in writing that if one was banned they all were. Background: Kristian II covets the crown of Sweden. In 1518 Kristian made a new attempt to become king in Sweden. He besieged Stockholm but without much success. The danish met a Swedish relief force at Brännkyrka and after a bitter fight the danish were defeated. The king returned to Stockholm and strengthened the siege. His ultimatum was that the Swedes must accept him as king or pay a huge amount of money. The bishops were to be released and compensated. But of course Sten refused. The fall came and the danish army suffered from desertions and low moral. The king offered negotiations on one of his ships but Sten smelled a trap and refused to appear. The king then proposed negotiations on land. Sten accepted and to prove his honest intentions he sent six prominent noblemen as hostages to the king. One of them was Gustaf Eriksson Vasa. Sten waited for two days at the appointed place but the king never appeared. He had sailed for Denmark with the hostages. In 1520 the last attempt was made by Kristian II to claim his right to the Swedish crown. Under the command of Otto Krumpen an army of danes, germans, french and scots attacked. Sweden had never before (and has sofar never again) seen such a blitzkrieg that was displayed. At Bogesund, close to todays Ulricehamn, Sten met the danish army with 10000 men. Sten was seriously wounded when a cannonball struck his knee early in the battle and the demorilized army was routed. Sten died a few days later and all appeared lost. But Stockholm was defended by Stures widow who was grandgrandchild to the Swedish king Karl Knutsson Bonde. Otto krumpen forced the counsil to proclaim Kristian II as king of Sweden. Most of the high nobility defected to the danish. Stens widow urged the people to resist but since none of the high nobility led the large peasant army it was crushed at Uppsala. After the betrayal of the nobility the Swedish were leaderless. Stockholm was besieged once again. By now Gustaf Eriksson Vasa had managed to escape from Denmark and had managed to get back to Sweden via Lybeck in Germany. 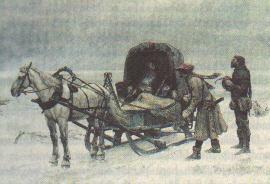 Sten Sture the younger dies of his wounds on a sleigh at Bogesund. After a long siege Kristian promised Stockholms defenders that all would be forgiven if they gave up the town. All prsoners would be released and nothing would be mentioned of what had been done against the danish or against the bishops. It would be a fresh new start. The defenders agreed. The preparations for the kings Swedish crowning began. It would be an unforgettable event, all agreed. They did not know how very right they were. The fateful day of november the 9th. The crowning was magnificent and the festivities inolved everyone. Dane and Swede fell into each others arms. But on thursday the 7th of November the king summoned the worldly and clerical leaders to him. Flanking the king was Erik Trolle and the kings advisor, Didrik Slagheck. An act of accusation was read in which Erik Trolle demanded full satisfaction and reimbursement including interest on lost income. He named eighteen of his opponents including the already dead Sten Sture and demanded them to be arrested and punished. He also made a case of the papal banning of Sten Sture which declared Sten sture and his followers as heretics. The king asked Erik Trolle if he could settle or if he wanted absolute justice. The archbishop wanted justice. The accused trembled. If condemned for herecy there was only one possible punishment. Death. Sten Stures widow stepped forward and stated that there was no one that could be singled out as guilty since they had all agreed to act a collective in paper. The document in which all stated that if one was banned they all were was produced. The names of all those that had attacked the archbishop was there to be read since they had all signed it. A complete list of arrests in practice. All by definition heretics. The king had promised forgiveness but now this was a clerical matter in which the king had no say. The interrogations continued all night, probably aided by a healthy measure of torture. In the morning a trial was held in which Erik Trolle acted both as prosecutor and judge. Not surpisingly the court found the prosecuted guilty of assaulting, robbing and physically abusing the archbishop. This was a crime toward all of the church and the pope and there could be only one sentance. Death. The king who recently had promised forgiveness and amnesty confirmed the sentances. The next day all of the inhabitants of Stockholm were ordered to the square. At noon the executions started. A german mercenary, Jörgen Holmuth, acted as executioner. The first two to loose their heads were bishops of which the first, Mattias, had been among those who had welcomed the king. 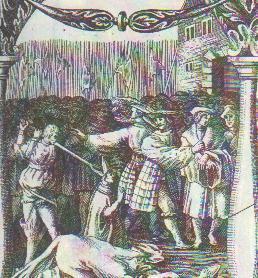 After these fourteen of the nobility were beheaded. Then three mayors and fourteen of the members of the towncounsil. After that the merchants of Stockholm started to be decapitated. The nobility lost their heads to the sword, more common people to the axe and the lowliest were hanged. Some were fetched from their stores and brought to the square were they immidietly were killed. A spectator, a merchant named Lasse Hass, began to weep when he saw what happened. He shouldnt have. He was brought forward and executed. The brutal killing continued for three days. 94 were killed. That does perhaps not sound very impressive compared to our days of genocide. But it corresponded to 1,5% of Stockholms population Today an equal percentage would mean 12000 killed. Among the killed was Gustaf Eriksson Vasas father. Gustaf himself had not been present at the festivities since he had good reason not to trust the king. But of the sentanced noblemen only six were executed, maybe eight. The rest recieved mercy. This proves that the king only wanted to kill the leadership of the Stureparty and not the entire nobility. The religious accusations were only a smokescreen. Didrik Slagheck was probably the mind behind the atrocities and convieniently was appoited bishop of the lucrative Skara since a sword had made that position vacant. He was later to die horribly himself. The king was responsible however and persisted when Sören Norby and Otto Krumpen tried to stop the killings. No women were killed. Only a few days after the massacre the queen gives birth to a daughter and the king holds a party close to the still bloodstained square. Kristian has since then been known as Kristian the tyrant in Sweden but as Kristian peasantlover in denmark since he did much for the danish peasantclass. The bloodbath commenced by the beheading of two bishops. When the king travelled back to Denmark many opponents were killed on the way. In Vadstena Sven Hök and Peder Smed were gutted alive and quartered. In Jönköping the two brothers Peder and Lindorm Ribbing were beheaded as were their sons, five and eight years old. The fiveyears old is said to have adressed the executioner when he saw his brothers blood stain his shirt. "- My good man. Please do not stain my shirt as you did my brothers or my mother will spank me." The executioner threw his sword and wept :"- No. Sooner shall my shirt be stained than I will stain yours." Of course a less sentimental executioner was produced and both the boy and the first soldier were killed. In Nydala the abbot and six monks were drowned. In Finland Hemming Gadh was beheaded. Gustaf Eriksson Vasa was still alive and had travelled to Dalarna were he tried to raise a rebellion. Many stories and legends still exist of his marvelous adventures when eluding the danes hunting him. This man was to cause problems to Kristian II. In fact, in some years he was to be king of Sweden. Gustav Eriksson Vasa as king of Sweden. CLICK HERE TO GET TO CONTENTS!